We offer two types of Wafer Machines which are economy (home use) model and fast production model. Our wafer machines works at an incredible speed and saves a lot amount of electricity& time. We provide highly efficient wafer machine at affordable prices. Capacity 250 kgs. Raw potatoes per day. Unique design. Three different processes for Peeling, Slicing and Drying of Potatoes / Bananas can be done in 1 Machine itself. Space Saving Design- machine is compact size & can be fitted in one small corner of a room. Double Z Ball Bearings for fast movement of the compartments. All the operation of Peeling, Slicing and Drying runs continuously on one motor itself all together, thus saving time and electricity. Ridged (Ruffles Type) Wafer / Banana Wafer/ Sali Wafer / Finger Chips can be made on the same machine by changing the Die. Refined oil or Vanaspati oil 27 Kgs. Flavoring: Salt, Pepper, Chilli, Lemon, Garlic, Cheese, Tomato, Masala. Add Flavoring powder to the taste as per proportion. From 250 Kgs potatoes about 80 Kgs. Wafers can be made ready. Note : Due to properties of potatoes having different water contents, the output may vary. Each of the 3 Processes in Potato Wafer Making… -Potato Peeling -Potato Chips Cutting / Slicing -Chips Drying / Dehydrating. …are done separately in these 3 different machines, thus giving greater speed & flexibility in work. Potatoes are feed into the drum, which has a special abrasive interlining for peeling. When sprinkled with water, it facilitates faster peeling, increasing efficiency. The peels get stuck on the inside walls of the machine, which can be later cleaned, leaving the potatoes bare without their skins. 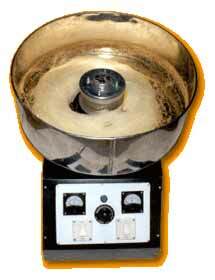 This machine retains all the nutritive elements of the potato without loss of any edible part. Only the peel is extracted from the potato. The machine is mounted on a M.S. stand having a comfortable height to enable the operator to attend to the machine conveniently. This machine is provided with special steel blades arranged in a cycle to slice potatoes evenly and rapidly into chips. The blades can be adjusted to obtain the required thickness of the potato slices. The potatoes after being sliced into chips are expelled at high speed from the machine. The thick butts (sides) of the potatoes (the wastage) are thrown out from one side & the thin wafers come from the other side. Even the thick potato ends can be used to make Sali wafers. The machine is compact and simple in operation. Special : Banana Wafer/Sali/ Finger Chips / Ridged / Ruffle Attachments also available. This dehydrator has a special stainless steel perforated basket to spin dry the excess moisture in the Potato Chips. The dryer rotates at a high speed, pushing the chips to the inside walls of the drum & thus extracting the moisture from the chips. The water from the potato chips runs down to the outlet at the lower portion of the machine. The potato wafers/ chips are now totally dried & ready to fry in Frying Pan. Remember, the drier the chips the more crunchy and crispy will the chips be after frying. Special : Tomato, Cheese, Masala, Lemon, Chili flavours available by the Kilo for adding on the chips after frying. Capacity: 800 Kgs. raw potatoes per day Each. Heavy Duty M.S.Body - with excellent paint finish. Double Z ball bearings: 2 Nos. All 3 machines - easy to clean & maintain.